In 1307 a political exile by the name of Dante Alighieri wrote a poetic verse of a metaphorical journey into the three domains of the afterlife – known to scholars as the Divine Comedy, Dante’s work was established as an important analysis of the christian mind, a contemplation and interpretation of the metaphysical within the realms of realism. He wrote the poem years after the early death of his lover Beatrice, and his political exile from Florence. He was a gaunt and tired man, punished by his own self loathing yet in an effort of rehabilitation – began to write again. Dante’s mental state was never questioned, despite the passion and fervent use of imagery that shaped our understanding of these posthumous realms. A group of Italian archeologists were called in to identify the find, among them an english Gentlemen, Charles Guilder. He was on a sabbatical from the University at Gower street, london. Little was expected to be found but it intrigued the young archeologist. The barrels had been left undisturbed, presumably by the superstitious workmen. They believed the barrels to be poor mans coffins, yet this was soon confirmed to be false. They cracked open the barrels and found a series of huge rolled, steadily crumbling calico sheets, daubed with black paint. Once spread on the floor, images could be seen in the miasma of morbid colours. There were faces in the dark, blackened charred faces. screaming hellish images that even Charles found hard to digest. Yet what Baffled them all was the signature. It was one word – Dante. A second chamber was soon discovered within the mausoleum, built lower in the foundations. Within this, a great ossified table, four metres in diameter, gnarled unidentifiable objects coated its surface. Within bound rolls of cloth a series of macabre illustrations on parchment. It was indeed the work of a man named Dante. They assumed collectively that this might indeed be the hidden residence of the great poet and politician, but no one dared say it out loud. Strewn on the floor were disintegrating texts, written in scrawled Italian. It made numerous references to the Inferno, his first movement of a trinity- odd and harrowing first person accounts of the creatures emblazoned on each page. They sat for many hours piecing through the catalog of information pertaining to his work on the inferno. 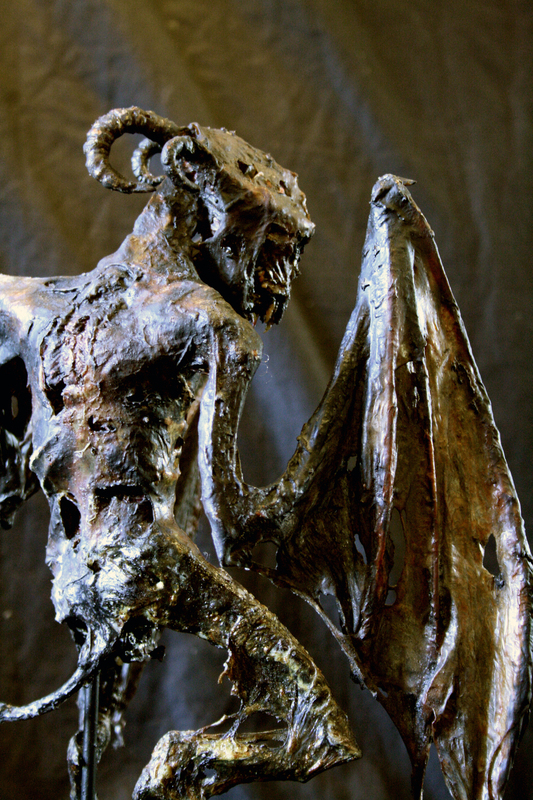 a demon of the pit. they talked for many hours, seated on the dust covered floor, brandishing various other artifacts that cast shadows within their minds. What were they to now believe? that Dante had indeed visited the lower vestiges of the Stygian wastes with his pier Virgil, or was this all a clever ruse of a man battling defeat? The men took with them all that they could carry, and shipped much of it to the University of Bologna. Much of the research was published and dismissed as both religious and literary heresy, and forgotten by the academia. Charles Guilder However did not forget. He returned to England in 1812, now a Professor of esoteric antiquities. 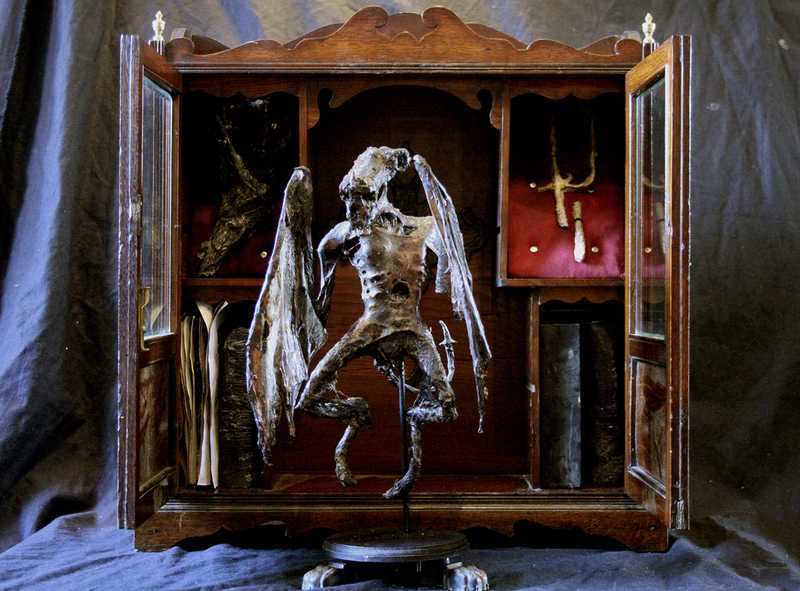 Within his study at Gower Street he held the demon within a cabinet. He had obtained a number of other objects along with the foreboding artifact – a petrified hand made of wood, presumably taken from the forest of the suicides, and a bone trident, unfortunately broken. 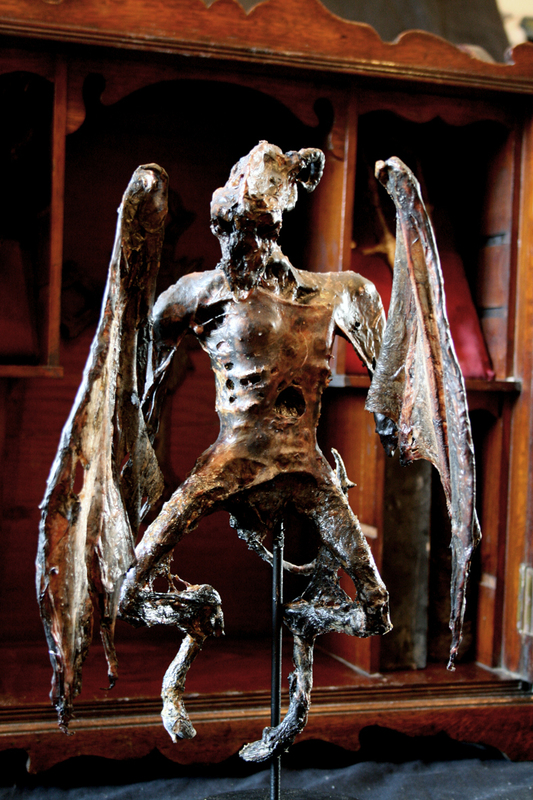 There were also a number of illustrations, the largest of which depicted a three faced winged beast, written on the back of which, “lucifero”. 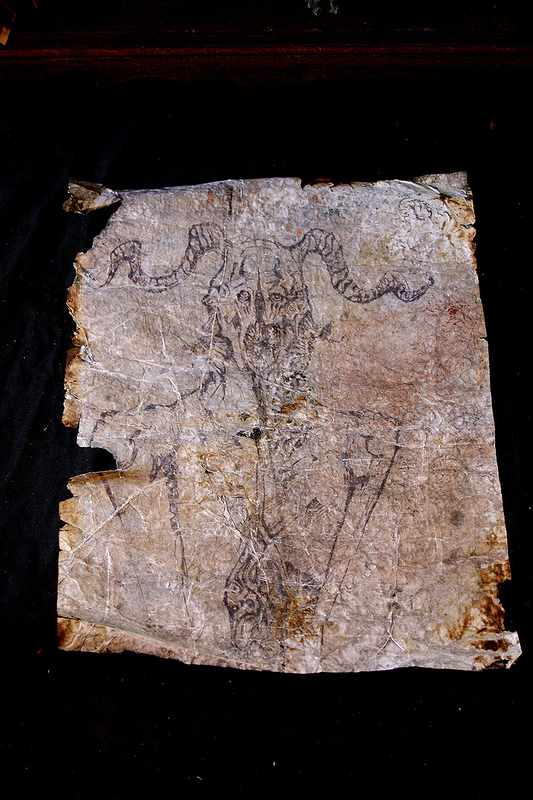 Perhaps the most disturbing, a piece of human hide, tattooed with eldritch runes.